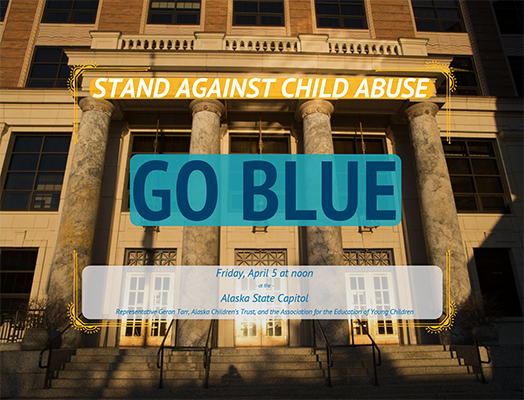 JUNEAU – In partnership with the Alaska Children’s Trust and the Association for the Education of Young Children, Representative Geran Tarr (D-Anchorage) is organizing a rally on the steps of the Alaska State Capitol to help raise awareness about child abuse and neglect. The event begins at noon on National Go Blue Day, Friday, April 5, and participants are encouraged to wear blue to acknowledge the importance of families and communities working together to promote the social and emotional well-being of children and families. “You don’t have to be a parent to help keep children safe and healthy: simply starting a conversation or learning more about the issues faced by vulnerable children in your community will help make Alaska more responsive and prepared to address these challenges holistically,” Representative Tarr said. April is Child Abuse Prevention Month, a nationwide effort to raise public awareness about and to take a stand against child abuse and neglect.